The first nights accommodation will be deducted from your credit card in the event of a no show or failure to give cancellation notice 48 hours prior to arrival. For Dorm Rooms an additional charge of $20 person is payable for Linen/Key Deposit. This will be refunded on return of Linen/Key on checkout. Any persons under the age of 18 must be accompanied by a responsible adult. Additional deposits are required for some group bookings. Welcome to Beaches, Broomes newest and most beautifully appointed budget resort. Situated just a short stroll from the famous Cable Beach, Beaches of Broome is a contemporary, stylish resort offering total luxury at an affordable price. 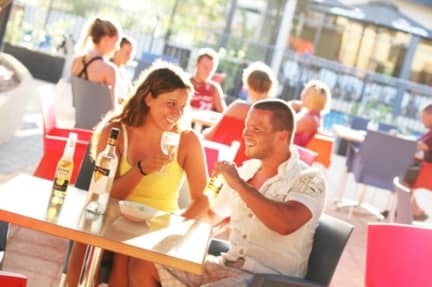 We have designed the resort to cater for everyone - couples, families, backpackers, groups and corporates. Rooms range from luxury Double rooms with Ensuite to Private and Family rooms with Shared Facilities and a variety of Dorms. Female Dorm rooms are available. All rooms are clean and modern, with air conditioning (dorm rooms are centrally controlled) and ceiling fans. All our rates includes a daily buffet continental breakfast and FREE WiFi. Airport pick ups are complimentary if arranged 48 hours in advance (April to September only, Conditions apply). We are located right at the beach, approximately 5km's from the airport and downtown Broome with the town bus service right outside. Facilities include a fully licensed bar, full communal kitchen, BBQ facilities, large swimming pool, DVD room, Tour desk, Luggage Storage, Scooter hire and more. Wet Season Reception hours are 7am to 9pm. Dry Season Reception hours are 7am to 11pm. If you are arriving outside reception hours, please let us know your arrival time so we can make arrangements to greet you. 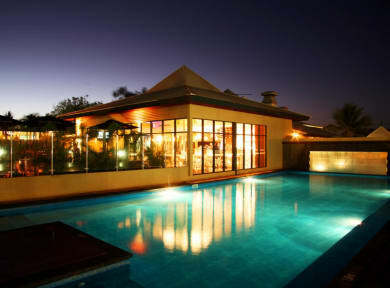 I thoroughly enjoyed my stay at beaches of broome. It was clean, comfortable and friendly. The staff were always helpful and happy to share their knowledge of the near by area. Aarron went over and above by having a look over my car when I was nervous I’d broken something on it. It is honestly one of the nicest hostels I’ve ever had the pleasure of staying at thank you! Absolutely lovely place to stay very friendly staff the managers are very approachable and the place is kept very clean. The pool is great and the supply of drinks great. The location is further out from town but shuttle bus running fairly good taxi's quite good price if need and staying near Cable beach for that sunset and camel riding is great. Best Hostel I've been to in Australia. Staff are AMAZING- cannot recommend enough. Loved my Stay there! Amazing staff, clean rooms, bathrooms and common areas, lot of space at the washing lines, great bar close to cable Beach (5 Min walk) and really important air-conditioned! The open stairscases and seating areas just gives it the perfect atmosphere for any time of the day in the Tropics! Only down point: Laundry didn't get washed properly, might be because of old machines. Still, Highly recommended! All staff were very welcoming and accomodating. Facilities were incredible. Others just note that this location is great as it is near cable beach, but over an hour walk into town and major supermarkets. The cleanest hostel I have ever stayed in and the staff were really on the ball and things ran smoothly. Really close to cable beach and a few minutes walk to the bus stop for town. It was pretty quite when we stayed so not much atmosphere but the pool area is lovely and it has a nice fresh feel. Cannot recommend enough. Very clean and comfortable, however there are no security lockers. Good free brekkie. There is very little atmosphere - it’s not a party place but it is a great place to chill. It’s an hours walk to the centre of Broome so be prepared. However, it is only 5 mins from Cable Beach which is a real bonus. I would stay again but not in a dorm room - the upper bunk beds had no power sockets.